Packing the best of our memorable stay in Cherrapunji (read – https://randomvoyager.com/waterfalls/) we drove up to Shillong. Beautiful nature dots the drive to Shillong. We drove past a lot Army and Air Force establishments. The Eastern Air Command is headquartered in Shillong. We reached our hotel a homestay which we had booked for 2 days only. 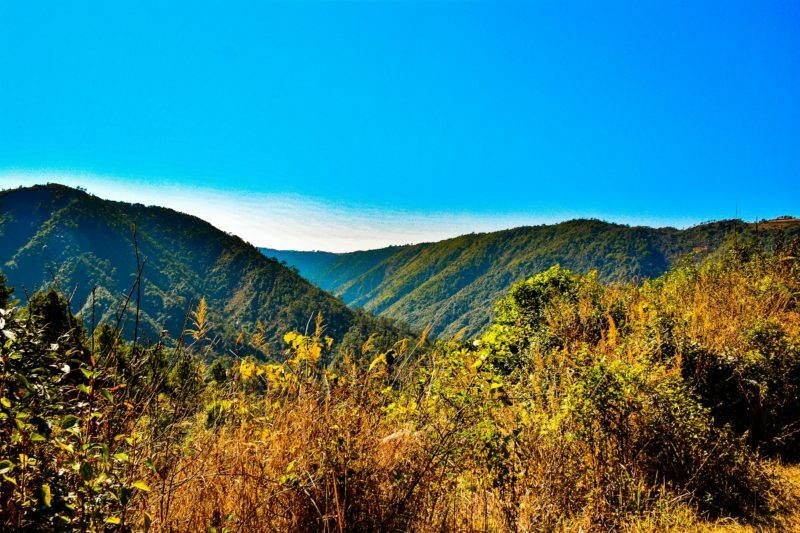 Laitlum canyons is another jewel in the crown of Meghalaya. The rolling hills, the misty expansive mountains, low hanging clouds, rivulets makeup the beautiful landscape. We took a short hike and then walked around in the quiet canyon around us. We soaked in the calm mountain air around us as we walked around the canyon. There are not many people that come here, so it is extremely isolated and yet there is a small shop that has water, biscuits, chips and soda on sale. A tiny village by the name of Rasom is in the canyons. This village has only about 350 residents who rely on a small ropeway to ferry their provisions to the village. You can see people walking down tiny mountain paths to their village. The place itself reminds one of a beautiful movie set of a forgotten hollywood movie. 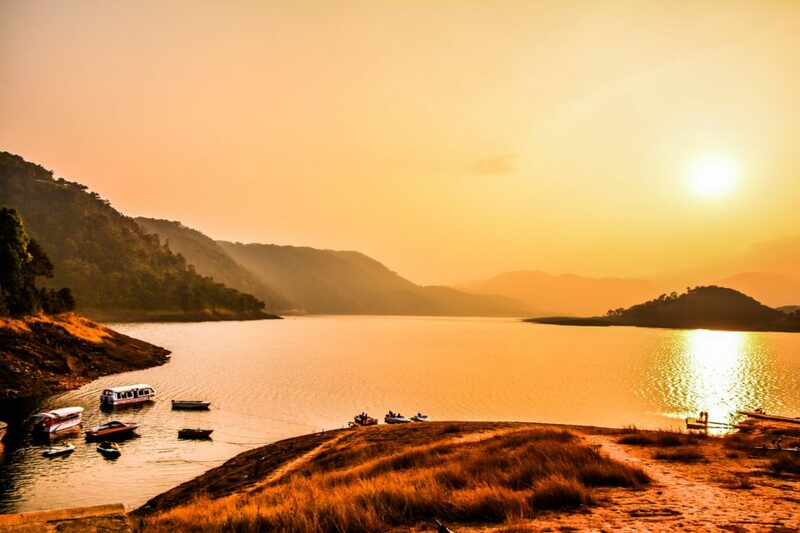 The lush and inviting canyons of Laitlum will definitely leave a pleasant mark on any one visiting it. Wards lake is another manmade lake. Sir William Ward, the erstwhile Chief Commissioner of Assam thought of the idea of constructing a lake here but the lake itself was dug out by a prisoner by the name of Jismot Chyme in his spare time, the designing and planning was done by Fitzwilliam Pollock. This is the reason this lake is also known as Pollock’s lake. Ward’s lake is one of the very well maintained lake with a botanical garden surrounding it making it a horticulturalist’s paradise. The beautiful blooms attracts beautiful birds. This lake is a wonderful place to birdwatch. There is boating in the lake , the lake itself has many ducks and geese floating in it. We spent half a day here enjoying the breeze and bird around us. Umiam lake is known as the Barapani lake commonly. Often times cab drivers will not respond to Umiam lake, but if you say Barapani lake they know exactly where you need to go to. 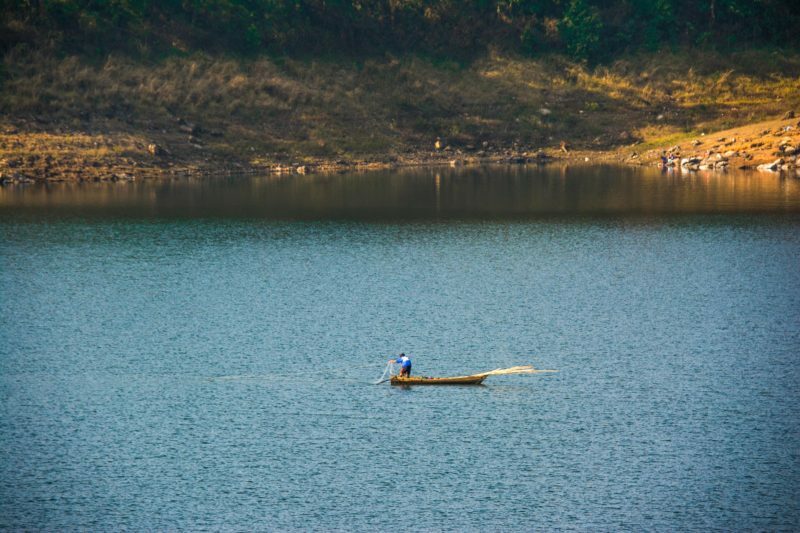 Umiam lake is only 15 kms from Shillong and does not take much time to reach there. This is a manmade lake by building a dam on the Umiam river. This dam was created to generate hydroelectricity. But it also has a few water sport activities like boating, kayaking, water scooter. You can walk around and hike a bit around this river. 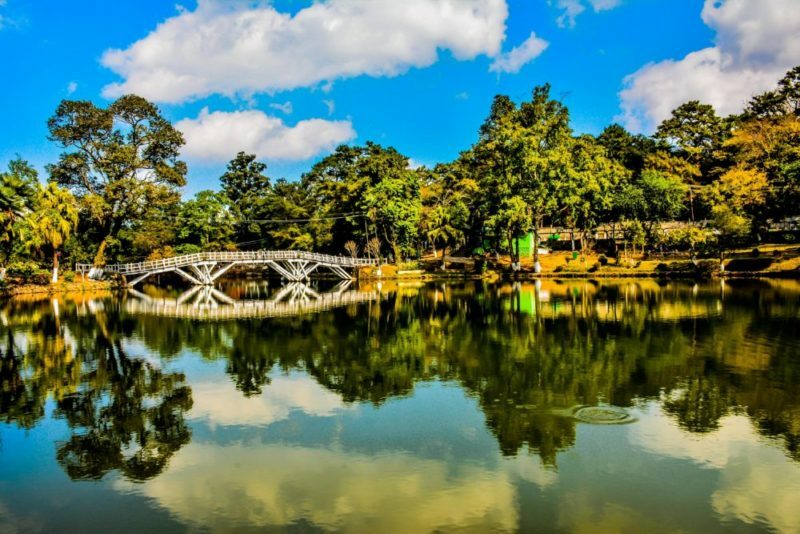 Lake Umiam is surrounded by many pine swaying hills, grassy hillocks which in turn is dotted with small villages all around it. We went hiking around this beauty and a whole day was spent enjoying the coming together of man’s efforts and nature. There were many small boats dotting the lake busy fishing. We also came upon a open fish store on a cycle by the river selling the catch of the day. While walking along the Umiam lake we came across Sohpetbneng Peak which is 6 Km from the base. Sohpetbneng peak is the same peak (tree ladder) that the legendary Khasi people are said to have descended from heaven to earth, after which God destroyed the tree ladder. We did not have enough time to go up and come down, so we skipped the hike up. The David Scott trail was discovered by a British official by the name of David Scott. This is about 16 kms long and can be easily covered in half a day. The trail starts from Mawphlang village and ends at Ladmawphlang village. This was originally a dirt road for horse carts . It connected to Sylhet (in Bangladesh now). The trails is a grand mish mash of winding trails that hug the mountain edges, sandstone cliffs, wide paths by the river, small Khasi villages, waterfalls, lush forests or brooks. The Umiam river gushes through in some of the places, there are a couple of reservoirs too on the trail. We got to The best way to hike the trail is by taking a guide at Mawphlang as they know the paths even where there exists none. The hike trail itself is hidden and not marked. The villagers on both sides use this trail as a shortcut to reach their destinations on either directions. There are no shops on the way so it is best to bring some kind of candy bars/ sandwiches for food and definitely water. We did drink the water right off of the sparkling waterfalls which tasted far better than the bottled one that we had taken with us. DST was earlier used primarily to travel between Assam and Bangladesh. The Khasi people under the banner of U Tirot Singh, king of the Khadsawphra Syiemship went to war with the Britishers over this road ( the Anglo-Khasi war). After four guerrilla style warfare they were defeated by the Britishers, due to their superior military strength, artillery and their use of muskets, which the natives bow & arrows could not match up to. The King was captured and sent to Dhaka, where he died in July 1835. 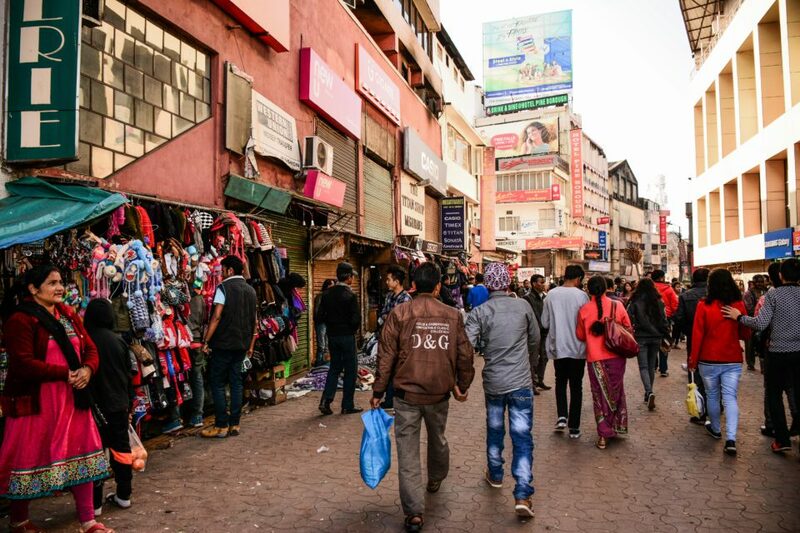 The police Bazaar is the bustling center of the city alive with people and activities. This is a very busy and a very commercial place to be in. We did stay in police bazaar as we wanted to be able to hire a cab easily. Some parts of this place is one way and one of the roads is completely off limits for any vehicles. This is where all the shopkeepers sell various kinds of things. From woollens, to fruits, handmade kitchen knives, bags, shoes, you name it they have it. If you want to eat authentic Khasi food in Police Bazaar Trattoria is the place to go. The restaurant itself is canteen style, nothing fancy but the food is lip-smackingly good and it will arrive in your table under 10 minutes after ordering. They do not have vegetarian dish mentioned on the menu but will very much make you one if you ask for it, as they did for me. We had several meals here when we stayed in Shillong. I had the JaStem with some veggies and pickles, my sister had the JaDoh everytime literally in various combinations. She said it was one of the best tasting dishes she had ever had. Bishop and Beadon point is a place from where one can watch the Bishop falls and Beadon falls. The Bishop falls has a sheer drop that is clearly visible from the viewpoint. 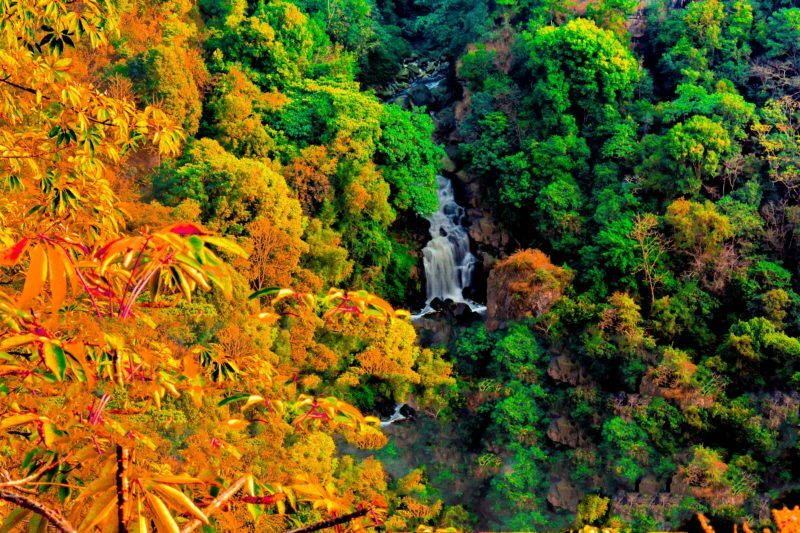 The Beadon falls is in many step like fashion and one can not view this falls continuously from this viewpoint. Make sure it is a clear day to go watch these falls as this viewpoint is on the opposite side of the ravine. On a cloudy or misty day one will not be able to view the falls at all. 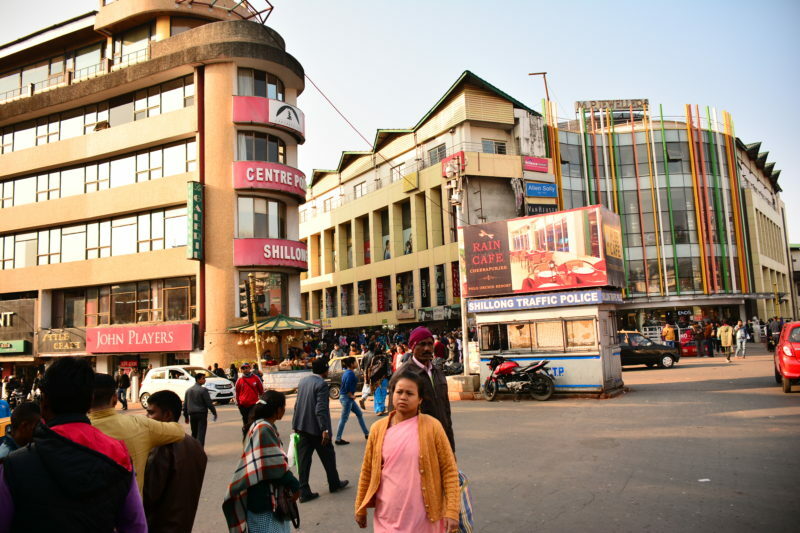 The highest point in Shillong is just a few kilometers from the Police Bazaar. This peak rises 1965 m above sea level giving panoramic views of the city. Shillong city derives its name from this peak. 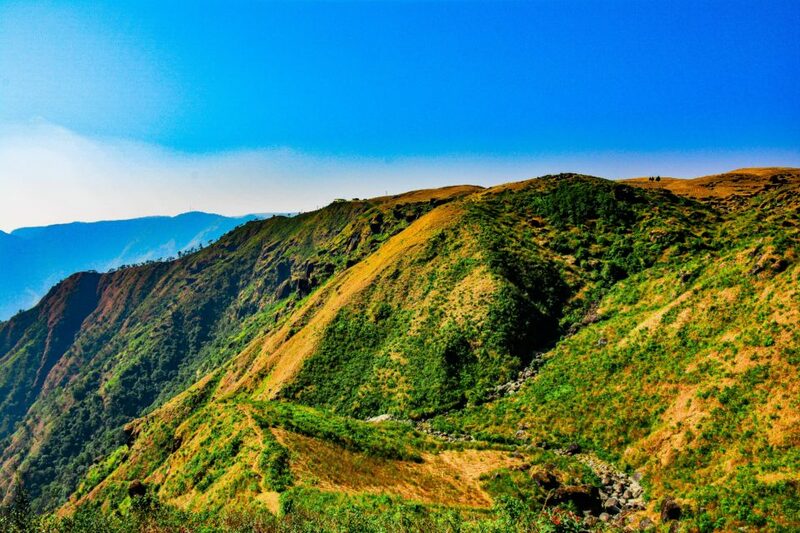 It is believed that Lei Shyllong, the God of Shillong peak resides here and protects the peak from evil.Take a taxi to the view point and then hike down. Always carry a water bottle, biscuits and some form of a bar (health or candy bar). Most of the places in Meghalaya are not commercialised so one might not find bottled water everywhere. Rain Jackets – Non-rainy season does not mean no rain at all. It just means less rains or light rains. During winters the evenings get really cool and the temperatures plunge to zero in the late evening, so carry heavy woolens. Mosquito spray is needed as most of the places are surrounded by jungles. Carry some form of fever reducers, antacids, cough syrup etc as shops close really early in Cherrapunji . The taxi drivers are fair when quoting for fares to far off places, so haggling is not always necessary. Remember to take a guide when hiking the David Scott trail, we did not and regretted it very much as we lost our way just 2 kilometers before the end point and had to go back all the way we came ! By Air: The closest airport is the Guwahati Airport. By Rail: Take train to Guwahati junction, connect via taxis and buses into Meghalaya.